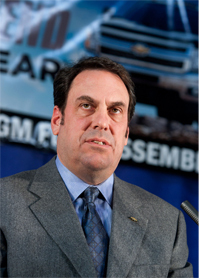 Every executive with a stake in GM&#8217;s inventory attends monthly meetings chaired by North America President Mark Reuss. If adjustments are needed, &#8220;all the right people are in the room,&#8221; sales chief Don Johnson says. Credit a new production discipline and a more sober approach to inventory management, which has resulted in pricing power and allowed the auto maker to flourish in the U.S. after the bankruptcy. GM simply does not need to keep its assembly plants running to cover massive fixed costs. “There is recognition within the company that we must keep our margins solvent,” Don Johnson, GM’s sales chief, told a meeting of Wall Street analysts in New York recently. A WardsAuto forecast suggests GM on Thursday will report a 2.2% sales uptick for November, compared with like-2010. Through October, deliveries were tracking 14.9% ahead of prior-year, outpacing the industry’s 10% growth curve. Against this backdrop, GM likely will report a second consecutive annual profit sometime early next year, a feat it has not achieved since 2003-2004. The annual report also will mark the company’s eighth-straight quarterly profit since its 2009 Chapter 11 proceedings and probably bring 2011 earnings to some $8 billion, up from $4.7 billion in 2010, if fourth-quarter expectations hold up. But the most impressive aspect of a return to profitability would be GM’s ability to make money in a U.S. market where light-vehicle sales are expected to finish the year in the 13 million-unit range. Prior to its bankruptcy that trimmed billions of dollars in burdensome legacy costs and sharply lowered labor expenditures, GM was unable to earn a profit when annual sales were as high as 17 million units. “We continue to be vigilant in reducing cost and complexity, while at the same time keeping our products king above all else,” GM Chairman CEO Dan Akerson said in a recent conference call to discuss the auto maker’s third-quarter earnings and its outlook for the rest of the year. The auto maker is taking down its Lordstown, OH, assembly plant this month for a week to keep inventories of its popular Chevy Cruze compact car in line with expectation, as Japanese auto makers to mount a comeback after the earthquake and tsunami in their home country in March. GM did the same earlier this year at pickup and SUV assembly plants to reduce bloated inventories. Years ago, the auto maker would have kept its factories running and then deeply discounted the production to move excess inventory off dealer lots. The strategy killed any profit GM might have made on the vehicles. It also eroded dealer margins, who were forced to borrow money to stock the extra vehicles. Johnson says the auto maker is using a new system to manage its inventories more tightly, without providing details of the approach. However, he says it amounts to every executive with a stake in GM’s inventory levels – from finance to marketing to sales – attending monthly meetings chaired by North America President Mark Reuss. “All the right people are in the room,” Johnson says. Production forecasts looking out 18 months are reviewed based on current production levels and monthly sales expectations. Some months, the group meets twice to make production adjustments if events dictate, Johnson says. Adjustments are made according to how high or low inventories for a specific model line, body style or weight class move off their optimum levels. “It’s a very nimble process anchored in a very consistent set of data” that runs the gamut to include residual levels of individual nameplates, daily-rental-sales percentages, consumer opinion on key vehicles and brand equity. Discussions in the meetings are frank. If a notion from the old GM gets suggested, it is greeted with a scowl of disapproval from Reuss. “A lot of unvarnished truth gets shared,” one insider tells WardsAuto. Decisions made over monthly production schedules and incentive spending during the meeting is followed to the letter, which in the old GM was not always the case. “We have a process that can be followed,” Johnson says. GM also sticks to a 60-day marketing plan, making only slight tweaks where necessary. The old GM might have sprung a new plan on dealers at the last minute in the hopes of making a certain number of sales in a given month. Rarely were such programs successful. “Often, dealers didn’t have time to comprehend the program, get their staff together on it and get advertising out to support it,” Johnson says. And the move led to bad behavior in the sales channel, he adds, because dealers would come to expect a blowout sale near the end of the month. Chris Hemmersmeier, executive general manager of the Jerry Seiner Group of dealerships in Salt Lake City, UT, says GM might still make an end-of-the-month adjustment to its marketing plans, but the practice has become less frequent. “It’s nice to know further out,” he says. “It helps to plan. But no, it does not happen 100% of the time. “I would say they have gotten better,” adds Hemmersmeier, who manages Chevrolet, Cadillac, GMC and Buick stores, as well as Nissan, Kia and Isuzu stores. Until recently, the group also sold Hummers and Pontiacs. “As long as they follow through, that would be helpful.” With production and inventories properly managed, GM exercises new pricing power because it does not have to incentivize as much. Prior to bankruptcy, the auto maker would have pricing power on a new product for as little as six months after its launch. Now products as old as three years command healthy margins, such as the Chevy Equinox. The cross/utility vehicle’s average incentive sits at a relatively thrifty 3% of its average transaction price. GM’s margins on its vehicles were about 10% as of the third quarter. That means the auto maker clears before interest and taxes about $3,000 for every $30,000 vehicle sold. The company sees room to improve those margins, currently the best since its bankruptcy. GM’s new breakeven point in the U.S. is just 10.5 million industry sales. Dealers win with tighter inventories, too. High vehicle stocks on their lots not only translate into high floor-planning costs, but unsold units also age quickly and can push up warranty costs. GM expects to close the year with inventory in the “upper 500,000-units range, Johnson says. That compares with an average of nearly 1 million vehicles in the five years preceding its bankruptcy, WardsAuto data shows.